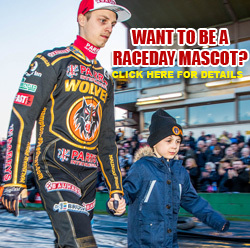 Wolverhampton Wolves Speedway: WONDERFUL WOLVES GO TOP! 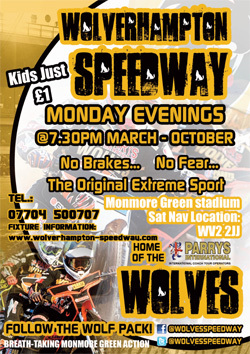 WOLVERHAMPTON moved to the top of the Elite League with a spectacular 55-35 victory over Poole at Monmore Green. 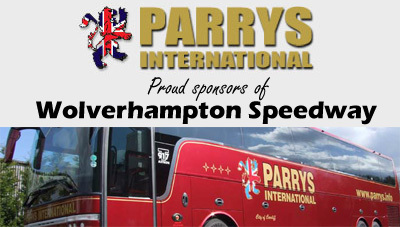 The Parrys International Wolves maintained their 100 per cent record as they put in a powerhouse performance to comprehensively see off the reigning Elite League Champions. It was another special night for the Monmore Men as they raced to a fourth straight win in front of a bumper bank holiday crowd. The hosts fell two points behind in heat three before back-to-back 5-1's from Jacob Thorssell and Kyle Howarth then Sam Masters and Max Clegg moved the Wolves six in front. 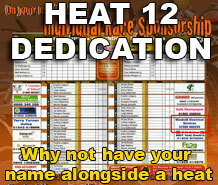 Two further heat advantages would see Peter Adams' side move twelve clear after eight, enabling Poole boss Neil Middleditch to nominate Bjarne Pedersen for a tactical ride in heat nine. 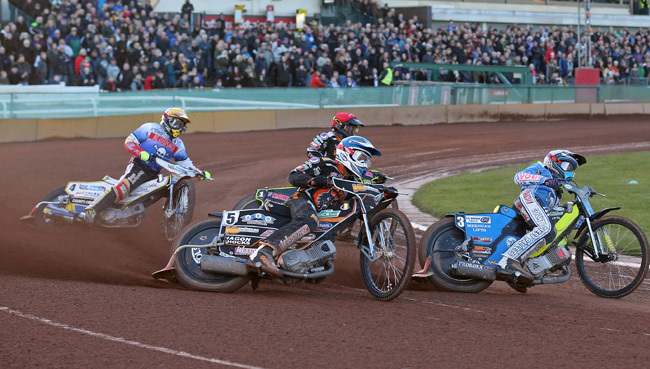 However, a great gate from Howarth allowed him to clamp Pedersen down as Masters swooped around the outside as the Wolves duo denied the Pirates double points with a maximum heat advantage. The Wolves sealed the victory in heat 13 before pulling further clear to wrap up a stunning 20-point victory. Team manager Peter Adams was delighted with his side's performance once again as they made it four out of four in the Elite League. "I'm quite surprised really because I expected Poole to mount much more of a challenge than that," Adams admitted. "But in all honesty, you have to give our team great credit and Poole just didn't have an answer to us - we had too much strength for them in every department. "We've got a solid side this year, they're all enjoying being here at Wolverhampton and we're on a great run right now. "We want to keep this going for as long as we can and we're hungry for points at Poole on Wednesday. "Of course it's all about how you finish the season, not how you start it but we'll enjoy sitting at the top of the league for the time being and we'll continue to enjoy the fantastic start that we have made." WOLVERHAMPTON 55: Kyle Howarth 11+3, Freddie Lindgren 11, Jacob Thorssell 9+2, Joonas Kylmakorpi 9+1, Sam Masters 8+1, Mikkel Bech 5, Max Clegg 2+1. POOLE 35: Hans Andersen 13, Brady Kurtz 6, Krzysztof Buczkowski 5, Lewis Kerr 3+1, Chris Holder 3, Adam Ellis 3, Bjarne Pedersen 2.